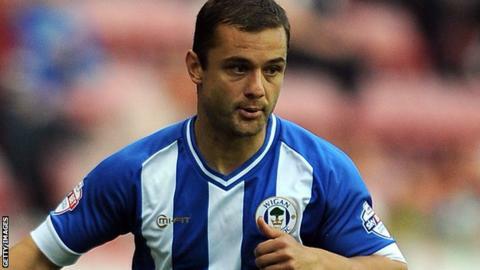 Shaun Maloney has left Championship strugglers Wigan for MLS side Chicago Fire for an undisclosed fee. The 32-year-old Scotland international midfielder's three-and-a-half-year spell at the Latics included an FA Cup triumph, and saw him score 15 times in 91 appearances in all competitions. "Sometimes you have to recognise that a move is for the benefit of all parties," said Wigan boss Malky Mackay. "Shaun is near the end of his contract and we had to make a decision." Maloney, who has 37 Scotland caps, joined Wigan from Celtic in August 2011 and won the FA Cup in 2013 with the club, beating Manchester City in the final before being relegated from the Premier League in the same season. A proposed move to Premier League Leicester collapsed this month after the clubs had agreed a fee for the winger, out of contract in the summer. "I think it is an opportunity of a lifetime" said Maloney. "I met with the manager early in January and on a personal level I got on very well with him. "I am very motivated and happy to be here. I have seen the results of last season but I think the team is very different this year with a lot of new signings. My new team-mates have been brilliant with me and I hope to bring a lot to the team." Chicago Fire head coach Frank Yallop called Maloney a "hard-working, attack-minded player". "His style of play fits in exactly with what we're trying to do at the Fire," he said. "We're very happy to have signed someone of his calibre."